Buyer has 3 days (72 hours) to have kitten examined by a licensed veterinarian (Buyer's choice). Failure to do so voids all guarantees with Jollytime Ragdolls. 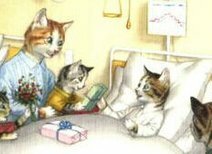 A dated copy of your veterinarian’s health assessment must be received by Jollytime Ragdolls within 10 days of receiving your kitten or this guarantee will be void. If your vet finds the kitten has a life threatening illness or genetic defect at first exam (within 72 hours of purchase date), you can receive a refund if you return kitten with ALL original paperwork, and a statement from a licensed veterinarian. I have the right to contact buyers veterinarian before returning a refund. No refund will be given for new owner being allergic or wanting to return kitten for any reason other than a defect or life threatening illness. Refund must be requested within 4 business days of kitten purchase. After 4 business days of purchase date, buyer has accepted kitten and 3 day health guarantee is void. Jollytime Kittens are guaranteed for one year of age against fatal Genetic or Congenital defects. In the event of a death within the first year of age, a replacement kitten will be given, no refunds. To qualify for a replacement kitten, a necropsy MUST be performed. Proof of genetic/Congenital defect must be made by a licensed veterinarian and ALL vet records sent to Jollytime Ragdolls. No viruses, bacterial infections, FIP or parasites are covered by the 1 year Genetic/Congenital Guarantee, as I have no control over the environment to which kitten is exposed.Kittens are guaranteed for 3 days of viruses or bacterial infections to ensure kitten was free of these conditions before leaving Jollytime Cattery. Jollytime Ragdolls is not responsible for any veterinarian expenses after kitten leaves our care. In the event of a replacement kitten needs to be shipped, shipping costs are buyer’s responsibility. Kittens need to be kept on kitten food (4 Health All Life stages) given by the breeder for 3 months after going home, to avoid diarrhea and stomach upset from food change. Food changes should be a slow process requiring several weeks.. If you choose to vaccinate your kitten against FIP or FeLV, this guarantee will be void. These vaccines are NOT core vaccines and can make your kitten sick, and will make them test positive for FIP and FeLV. Only have your kitten vaccinated for feline distemper (panleukopenia), calicivirus, and rhinotracheitis and do not give rabies with any other vaccine at the same time. All kittens sold as pets must be spayed/neutered before 6 months of age.